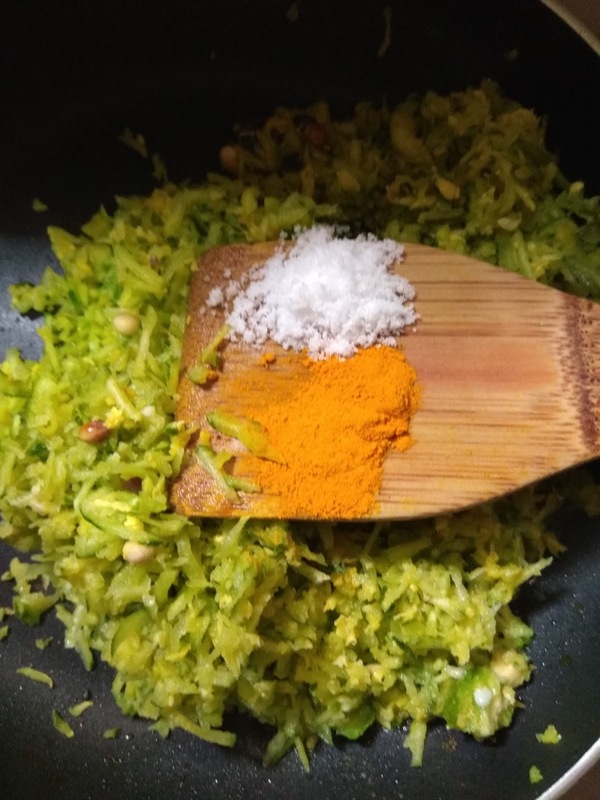 The raw papaya is a health food among the eastern states of West Bengal ,Assam and Odissa.It forms a regular part of the diet owing to its many food values.among other things,the raw papaya is an excellent natural de-worming agent ,and works very effectively if consumed in a regular basis. 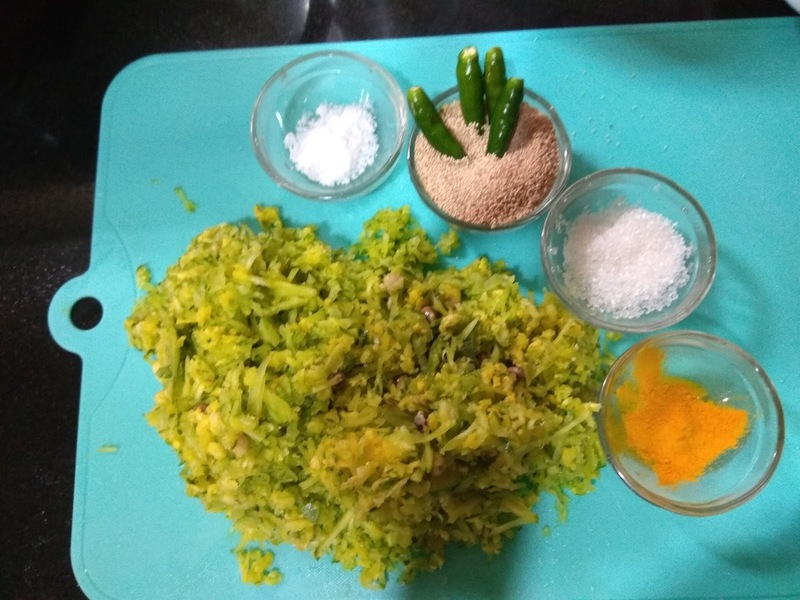 This vegetable is taken plain boiled with rice with a sprinkling of mustard oil ,or it is consumed by making its preparation without onion and garlic.This is best eaten on days ,when you want to eat a plain homecooked non spicy meal and yet not miss out on taste. 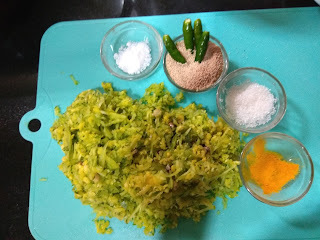 The raw papaya needs to be peeled first,once the green skin has been peeled,it has to be cut into pieces lengthwise,and then the inner potion (the white ends of the seeds have to be scraped out.If not done the preparation will get a bitter taste.Once done the long pieces have to be cut into bite size pieces and then kept in water for 15 minutes. 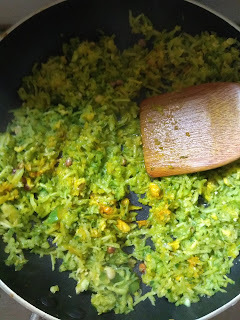 This dish does not call for coriander leaves,the flavours are best enjoyed when garam masala is added to it.and the ghee adds a subtle touch of tradition to it.I always use a mix of green cardamom,cinnamon and cloves,the quantity of Cinnamon being the highest.Sugar is the quintessential element in all traditional Bengali fare,so makes it way in this dish too. The quantity of the cumin ,coriander and the chilli powder can be increased if you want more gravy in it.Needless to say the quantity of oil also increases with the spices. 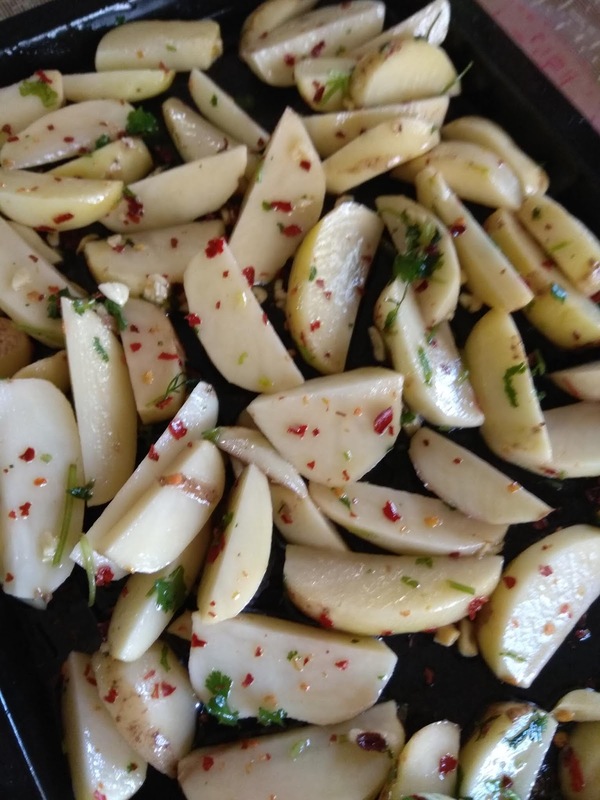 1- Take the papaya cubes out of water and boil them till tender.Alternatively ,you can also pressure cook them with little water till 2 whistles .The papaya pieces should not get mushy,they should be cooked but stay firm. 2-Take them out of the water and discard the water. 5-Once the cumin splutters,add the potato pieces with the salt and the turmeric. 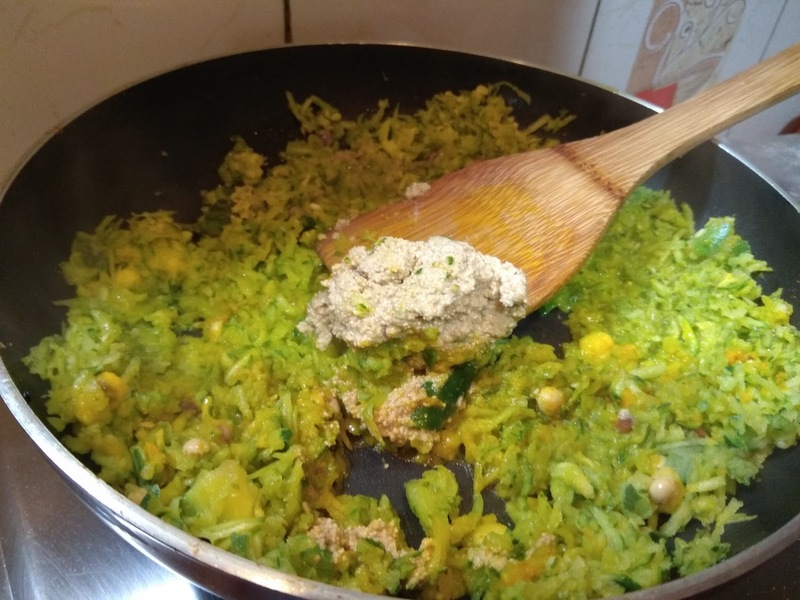 7-Add in the papaya pieces,and add the cumin ,coriander and chilli powder over the papaya. 10-Remove the lid and add water ,increase the heat to high and bring to a boil The quantity of water depends on how much gravy you want and the quantity of spices you have put. 12-Switch off the flame and leave covered for ten minutes before you serve. 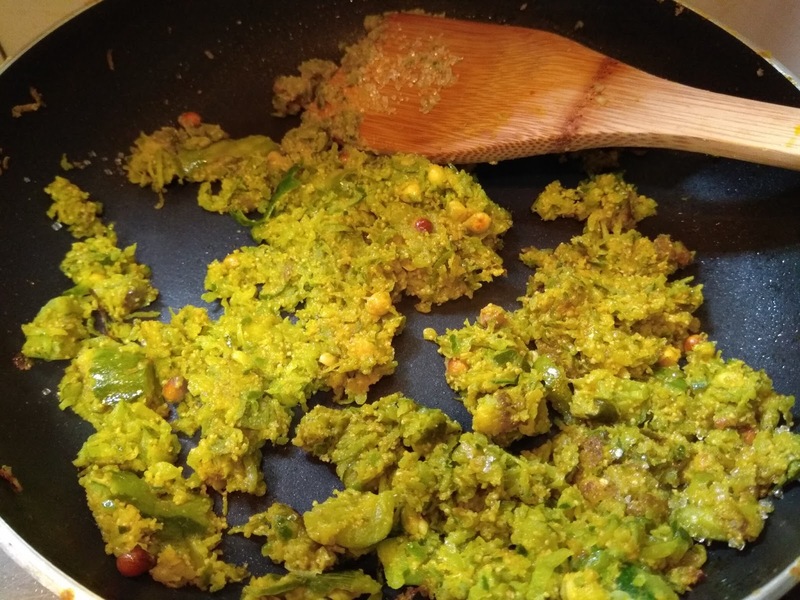 This preparation is best enjoyed with steamed rice.Though some people love to have it with hot ,thin chapati or phulkas. Ever since I have got married ,and stepped into my in laws place ,I have been hearing many a praises of this recipe.The patol bata,bata in Bengali means a ground paste,and in this case it was the parval or patol grated and cooked in poppy seeds.the Bengali vegetarian cuisine has many such bata,especially done with different varieties of yam and the mash is cooked in varied spices.This particular mash of parval is my mother in law's recipe or my grandmother in law's (my mother in law's mother) recipe to be more precise.Since it is one of my husband's favourite things I wasted no time in learning it.Now in course of time my daughter"s have also started liking it. 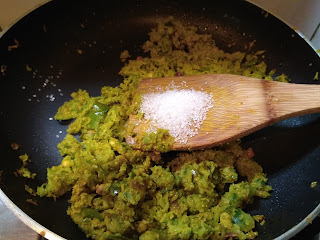 Mix again till the mixture turns slightly red at the bottom and gives out the aroma of fried khus khus. 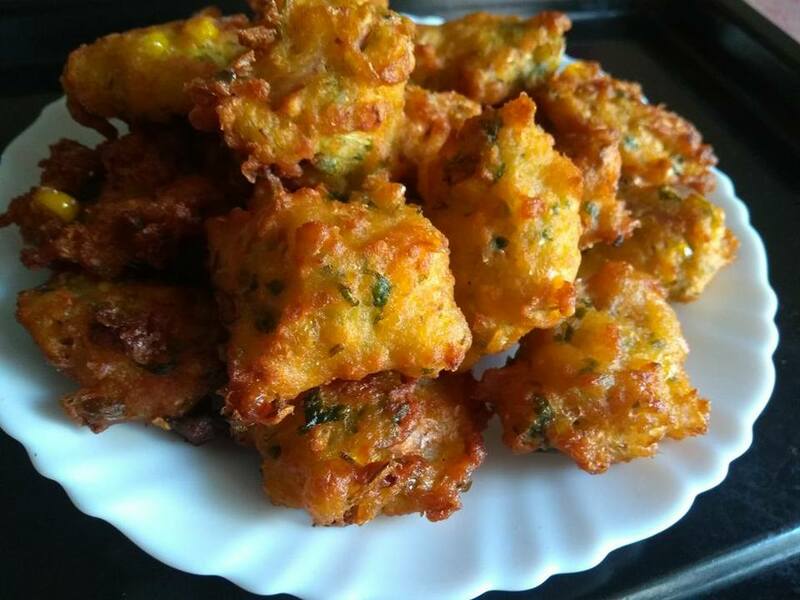 Fritters are always the saviors when you have not made anything quite interesting for meals especially on weekends.And helping the kids with their studies ,bringing them back from their activity classes ,all this after a very elaborate breakfast ,leaves me with little time for preparing lunch. This is when I peep into the refrigerator for some instant help ,and I come across the corn kernels lying in there. I find the sweet corn an amazingly useful ingredient in the kitchen.Owing to its sweet taste it can be made into many things,like fried rice,sandwiches cheese corn balls or simply boiled .It is always a favourite amongst kids.The sweet corn fritters that I am sharing today is a very easy recipe,and can be made almost instantly.All you need are some of the basic ingredients available. 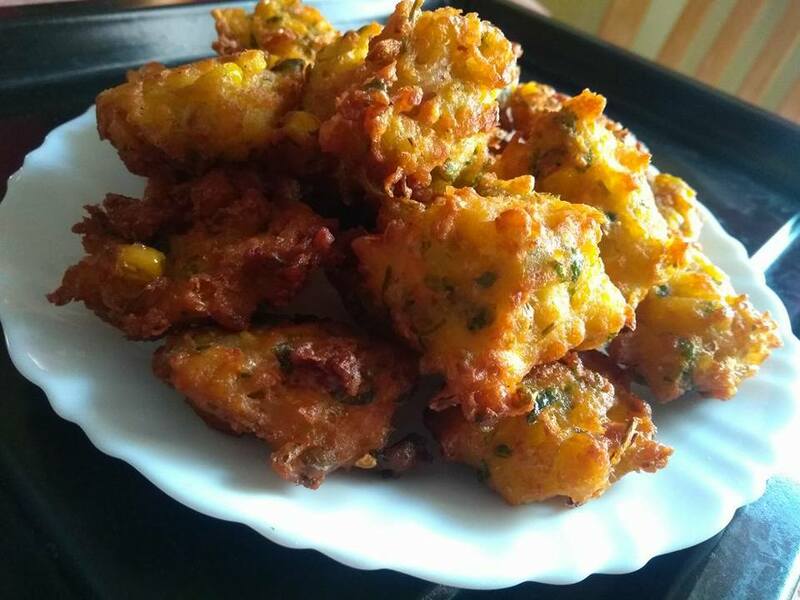 The other day I made this as a side dish for lunch,and it was an instant hit.The crunch on the outside and the sweetness of the corn is to die for.I have added a few pieces of capsicum to it ,corn and capsicum complement each other a lot,and the capsicum also makes up for some body of the fritters. 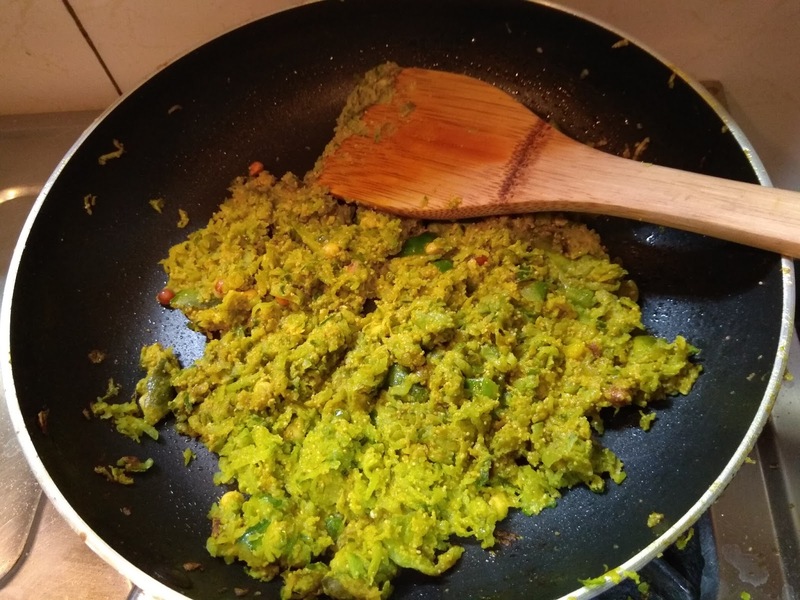 I practically had no time for clicking a fancy photograph,.the fritters vanished in no time Somehow managed to get a few clicks. About one and half cups is to be coarsely ground while the other half cup is to be added whole. Mix all the above mentioned ingredients except the oil and leave aside for fifteen minutes. 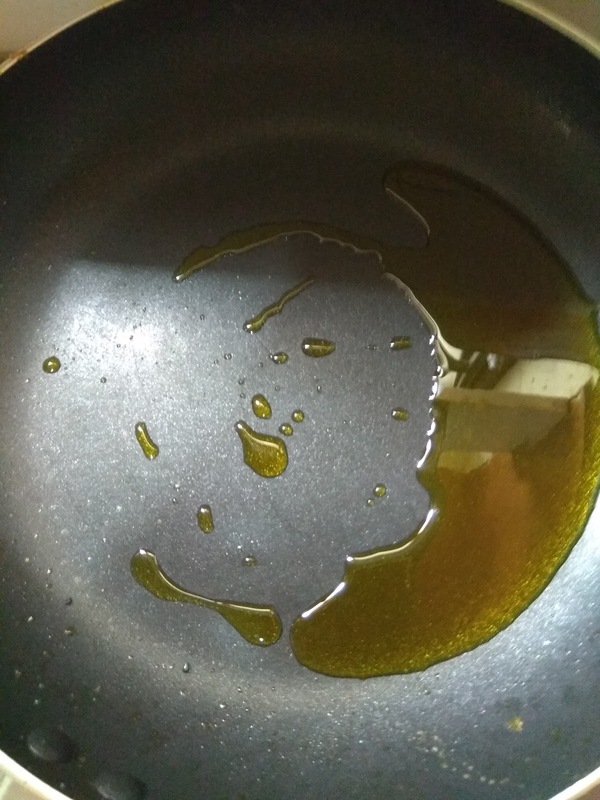 The consistency of the batter should be liquidy enough to be taken by a spoon. 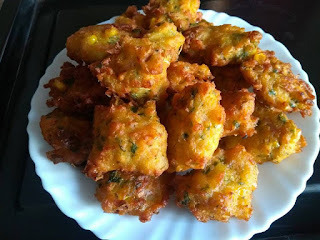 Add the baking powder just before making the fritters. A very tight batter will make the fritters hard from inside. Serve hot with tamarind chutney or tomato ketchup. 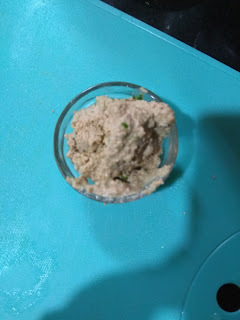 Though the prawn malaikari ranks first in all Bengali households ,in my home the chingri aka prawn is best enjoyed with cauliflower.Quite possibly because this recipe can be enjoyed with rice and luchi ( puris) alike. Bengalis and their love for potatoes is in separable,so the potatoes do have their presence in this recipe too ,and somehow I cannot imagine the recipe without the potatoes. The cauliflower florets are covered and shallow fried with till they get a reddish colour,to release the aroma of fried cauliflower. 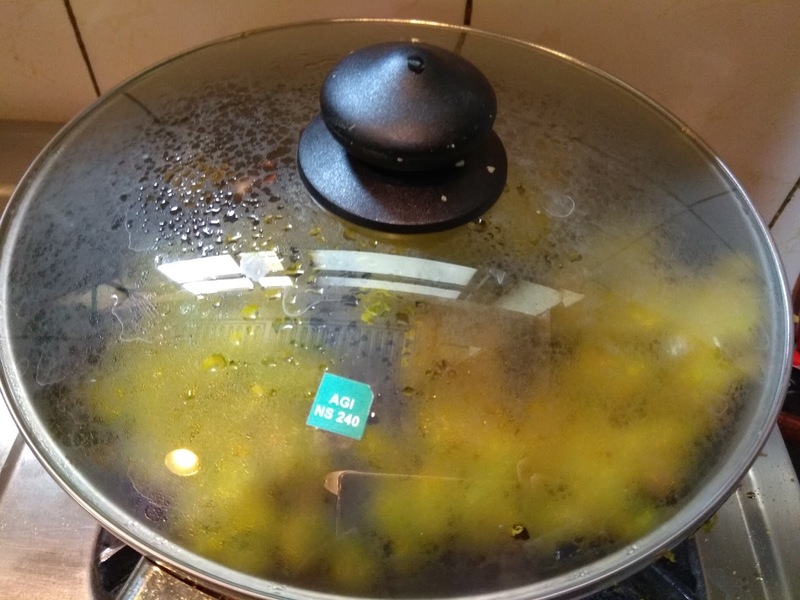 As for the prawns ,I do not shell them completely,I leave a part of the shell for the colour in the gravy.I devein them and leave the head of the prawn partially intact after cleaning them,as my husband enjoys the head too. For some added colour I have used the kashmiri mirch powder,and you can also put some slit green chillies for some more flavour.i avoid that for the kids in my house . 13-Serve hot with steamed rice or puris. 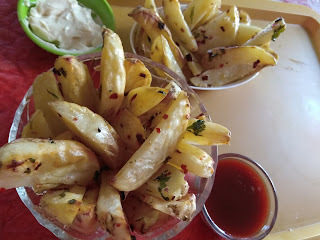 Baked potato wedges ,is a healthy potato snack ,and once I learnt it I have stopped getting the frozen ones from the stores.This is a very quick recipe and so easy that once I made it only once.Since then my teenage daughter has taken charge of making it every time without any supervision. 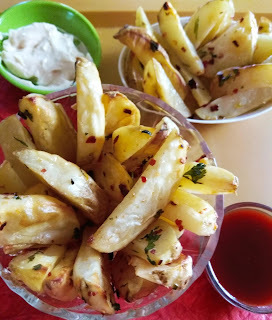 This can be on the menu in kids parties,as this is an extremely kid friendly recipe.I make the wedges very often as an appetiser when I have guests for dinner,since It is easy to make and very light as well.